This is an 8-4 Nomad Quad + 1, with a double-bump round-pin tail. The 5-fin set-up allows Kirt the greatest range of fin configuration choices; Single, Twin, Twin with trailer, 2+1, or quad. Boards dimensions are 8-4 16-3/4″ x 22-1/2″ x 15-1/2″ 3″. Bottom is fairly flat in the middle, with slight convex in the nose and V in the tail. Board has low entry rocker with and a slight kick in the tail. The double-bump tail, tail-rocker kick and V placement will keep this board loose and free despite its relative size. 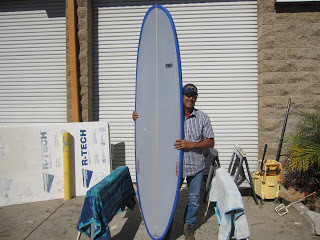 The low rocker makes it an easy paddling board that will be very fast when in trim. Now all Kirt has to do is to decide which fins to use.